Kenton Brothers helps the City of Grandview install security cameras at their new amphitheater. Kenton Brothers helps the City of Grandview install security cameras a their new amphitheater. Grandview Amphitheater is just one of many examples of cities going above and beyond to involve their community in the arts. 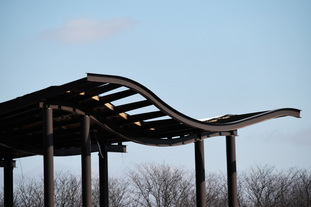 The Grandview Parks and Recreation built an event space in 2014 that has the capacity to entertain 8,000 guests. These amphitheaters engross citizens and surrounding areas in music and create a space for people to come together, and enjoy a common interest. Kenton Brothers had the opportunity to secure that feeling of community, with an advanced security system that helps fun goers to focus on the show and the City of Grandview Amphitheater to feel protected. Kenton Brothers installed a series of high resolution video cameras, throughout the Amphitheater, which help protect against any unwanted emergency situations. Kenton Brothers was thorough to ensure that the space is kept safe with a series of dome, wall mount, and corner camera systems. This technology driven camera system helps to make sure the entire area is kept safe, allowing citizens to check their worries at the door. https://kentonbrothers.com/wp-content/uploads/2016/06/GrandviewAmp.jpg 207 311 Kenton Brothers https://kentonbrothers.com/wp-content/uploads/2017/10/Kenton-Brothers-Logo.jpg Kenton Brothers2016-06-27 12:08:412019-03-25 11:30:38Kenton Brothers helps the City of Grandview install security cameras at their new amphitheater. Kenton Brothers Classic and Signature Maintenance Programs…Take a Look! To download a pdf of this flyer, click here! 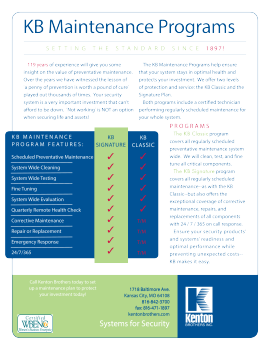 https://kentonbrothers.com/wp-content/uploads/2016/02/KB-Maintenance-Programs-graphic.jpg 417 457 Kenton Brothers https://kentonbrothers.com/wp-content/uploads/2017/10/Kenton-Brothers-Logo.jpg Kenton Brothers2016-02-25 09:48:042019-03-25 11:27:32Kenton Brothers Classic and Signature Maintenance Programs...Take a Look! Brad and Jeremy recently returned from a foray into Colorado, working on our national install for Russell Stover’s candies. Kenton Brothers was called in by the box candy giant to help with access control in their manufacturing and distribution centers located across 8 different states. The company needed quicker access for their employees during shift changes, and the ability to control everything from company headquarters here in Kansas City. We came through with optical turnstiles from Alvarado and S2 Enterprise level software management. This state of the art, secure, bi-directional turnstile access control responds within 1/1000 second to credentials and uses ‘stacking’ capabilities during high user intervals. This technology allows a user to present his or her credential (card), to walk through the gate, and keeps the gate open for the next user to pass through; thereby eliminating the slow-down which occurs when the gates close after each individual user. Add in S2’s Enterprise software, and you have a custom system with global site management all controlled and administered from their company’s headquarters. Innovative thinking for an age old business still using small batch production to maintain the original quality of Russell and Clara Stover’s bungalow candies. For innovative solutions to your access control challenges, whether you have one location or you cover the nation, contact Kenton Brothers in Kansas City at kbsales@kentonbrothers.com or 888-536-8661. Oh…..enjoy the pictures sent from the mountains, and feel free to read the full case study on Russell Stover’s candies!